To be fair Mansfield is the only "big" town near any of them. I was being sarcastic mostly because I thought you were from bucyrus. Bucyrus hosts a bratwurst festival (at least they did) that was outstanding. If you are a boating fan, Baja boats had a factory there that I helped build part of when I was a kid. I'm a fan of the guideline of limiting to 4 grain varieties when making recipes, as it makes it much easier to learn the ingredients and know where to make adjustments. For me personally, I've ended up with a "grainy" taste when leaning on the darker crystal malts and not had the color desired. I don't think you are going to get red but dark brown - condense & reduce on crystal and kick up the percent Munich or oats. For reference, looking at this week's AHA recipe of the week, "Tsunami IPA", he's got 12 oz of crystal 45 within 3 malts + sugar. Looks like roughly 5%? re: http://www.homebrewersassociation.org/pages/community/blog/show?title=recipe-of-the-weektsunami-ipa A fun alternative would be 10 or 12 oz of CaraRed. Also do not overlook the recipe of topher.bartos in this thread: 3 malts and 6.6% on the 20L crystal. IMHO of course, recipe building is great fun. Seems like the main concern is that this is going to turn out more brown than red. I just drank a Green Flash Hop Head Red....It's pretty brown. But anyways, I did do some adjustments to my original recipe. I just bought the book "Beer Captured" and it lists the recipes of some of my favorite red-ish color beers amongst others. Burning River Ale from GLBC is somewhat amber / reddish... it's just 2-row pale malt, crystal 40 and biscuit malt. The other one that I consider sort of red(ish) is Celebration Ale that's 2-row pale malt, dextrin malt and crystal 80. I think the point is and I've just figured this out, it's doesn't take a lot to color beer. I'm trying to figure this stuff out. A little bit of malt does go a LONG way. You might not need Chocolate malt if you're using crystal 120. But, who knows. Brew a batch and let us know!! I might not need the Chocolate malt. That still may go away. I have to brew this beer soon or this recipe will be completely different than when it was first thrown together. Burning River is a pale ale, and SN Celebration is an IPA. I guess I am going more for the "red" taste other than actual color. If you haven't tried Green Flash Hop Head Read, Oskar Blue's G'Knight Imperial Red IPA, or New Belgium's Red Hoptober, then I suggest you try them. That's the malt flavor I'm trying to achieve. Hop Head Red has a stronger malt taste than the other two. Normally I do not prefer a heavy malt taste in a traditional IPA, but since it's a red IPA, I'm all about it. I don't know. I'm still going to try out your recipe. It sounds good. I'm currently collecting 1st runnings for an ESB where I used Maris Otter, Special B, and Crystal 60. It's a very amber / orange color. Looks beautiful. Still, let me know how your Red IPA comes out. Start brewing!!! I am anywhere from two to three weeks out from brewing this one. It's on deck behind a Prima Pils clone. 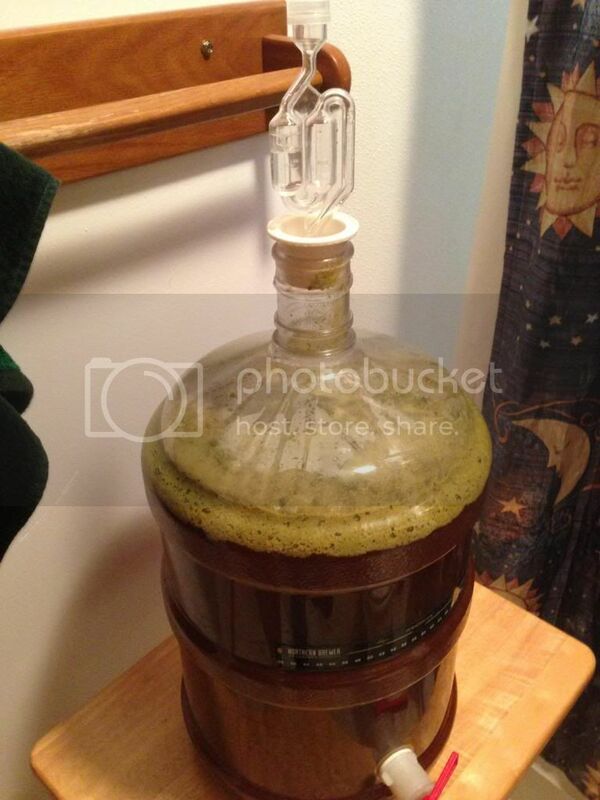 I want to get it brewed and lagered for a nice late spring beer. But I will keep you posted. Glad I saw this. I am planning one as well but mine is a bit more stripped down. I believe that this is close to the hop profile used in Green Flashes Hop Head Red....One of my favorite beers...I just opted to add Simcoe to my Amarillo. I would suggest kicking the 2 minute Amarillo to 0 minute. I will finally be brewing mine on Friday. I weighed out the grains and hops tonight for the later adjusted recipe I posted. I hope I can squeeze a starter in on Thursday. Regardless, it's getting brewed Friday....I've been excited about brewing this one for awhile. I just finished up racking this beauty onto 1 1/2 oz of Simcoe and 1 1/2 oz of Amarillo. The suspense is killing me! So, how did this turn out? Were you happy with both the color and the hop profile? Sorry. Yes it turned out well. I did take note to changes that I may do when I brew it again for the fall. The color wasn't red, which wasn't a surprise nor did I care. It was closer to brown. I was just looking for the "red" taste. It didn't have the malt taste that I was desiring. I will do away with the chocolate malt altogether. I may get rid of the 60L and 80L caramels and just up the 120L. I felt that the simcoe over shadowed the amarillo, so I may change it to 2 parts amarillo and 1 part simcoe. Or I might just switch the dry hop additions to centennial. All in all, the beer turned out very well. I will brew it again with these types of adjustments. If it's the "red" malt character you're after, I think ditching the chocolate is wise, but I would increase the 60-80 L crystal over the 120L. To me, the 60-80 are the "red" grains that matter.